So I haven’t been writing. Imagine that, this blog has always been a flurry of posts. Some month’s would be great, others not so great. Yet here I am trying again. I guess that’s something I also take into other parts of my life, like running and ultra running. Sometimes I’m not the greatest at planning and executing those plans, but I’ll damn sure try again until I get it right, or just get bored and decide it isn’t for me (which doesn’t happen often). While I haven’t been writing, I actually HAVE been running and training. I finally feel like I found a schedule that works for my not-so-new 8ish to 5ish schedule. Is it weird that I still feel like I’m getting used to the full time gig? It’s been over a year actually 2 years in September. I guess I’m like a fine wine on all fronts, I’m better with time. 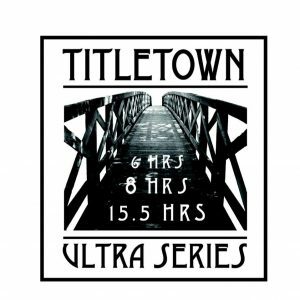 Titletown is an ultra race series with three events to choose from; 6, 8, or 15.5 hours. The course is a 4.75 mile loop and you run it as many times as you can within the allotted time to accumulate as may miles as you’d like. You can chill out when you wish, stop when you wish and start back up when you wish, but once you turn in your tracker you’re done for the day. Usually when people hear that the loops are ONLY 4.75 miles I hear phrases like “I’d go crazy running in circles that small”. The Titletown course has so much variety that it stops you from getting bored. There’s a little bit of trail, crushed gravel, pavement, dirt, and hills. It’s a good size so that you can see your crew often and grab some positive energy along the way. This size loop is seriously good for new trail runners, new ultra runners, klutzy runners (like myself), fighting nagging injuries all the time kinda runners (also like myself), and it works well if the weather turns out to be finicky. Things have been crazy at home, Andrew has launched Little Cheeky Ice Cream officially and now he juggles 2 full time jobs, so when I told him that I had a race that would take an entire day out of his business he told me he wasn’t sure he could swing it. When I told him I couldn’t find anyone to really support me that weekend, he put his life aside for an entire day to take care of me while I ran in the woods in some CRAZY heat. 10 days before a race is usually when I start looking at weather predictions. 10 days out didn’t seem too bad, but as the day came closer and closer the temperature predictions climbed and climbed. 98 º was the projected high along with high dew points and high humidity. 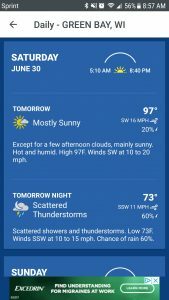 We’d be running in triple digits by the afternoon and STARTING the race around 80º. Originally I had hoped to hit 50 miles, but in heat like that I KNEW it wasn’t possible. My one and only goal was to get through the day without getting any sort of heat related illness. The day before the race I packed all my nutrition and went out to buy cooling accessories. I bought bandanas to wrap baggies of ice in, a cooling towel (which wasn’t all that great), and even a couple of cold packs just in case we got desperate. I also purchased a canopy tent for Andrew to sit under during the race. He had his own little ultra set up with a camp chair, cooler, and book to read while I ran. The morning of the race, runners and their crews set up mini aid stations, it was like an ultra camp. 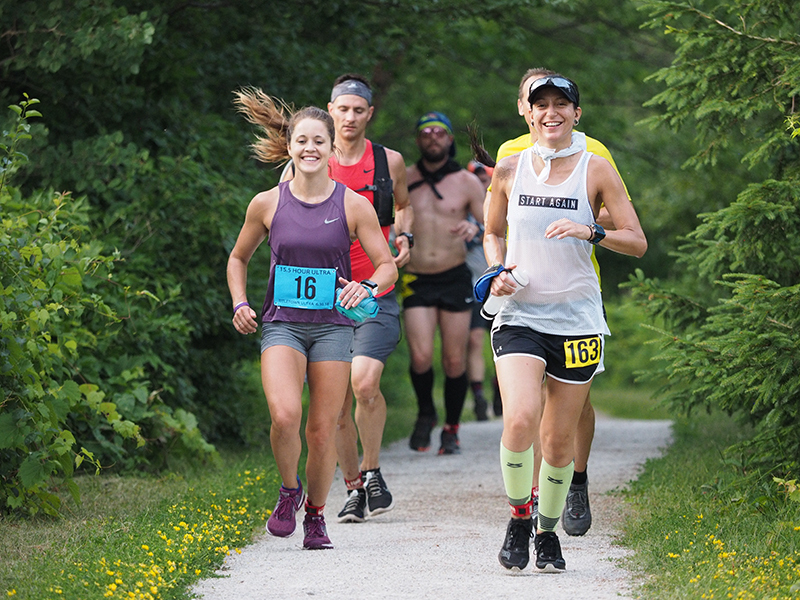 Crew members lined the course with tents, tables, chairs, coolers, and everything they and their runner would need for a long day of running. It was definitely my type of ultra camping. Our set up was a little bit passed the start finish line and the official aid station. Andrew and I got set up just in time. 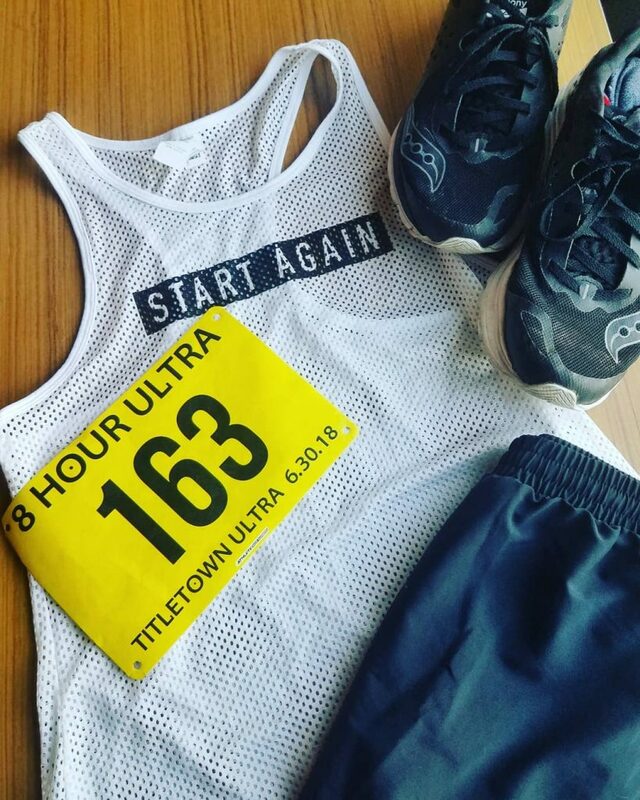 I didn’t even get a chance to stop at the bathroom before and I felt a little flustered as I pinned my bib on, slicked up with body glide and sunscreen and braided my hair just before the race started. It was very difficult to hold back my pace. I was hoping to hold my pace steady around a 9 minute mile, but with the heat, I knew I couldn’t sustain that. Before the race I told Andrew I would stop every 2 loops but after the first loop I HAD to stop to refill ice and water. Stopping to refuel and refill was necessary after every loop. 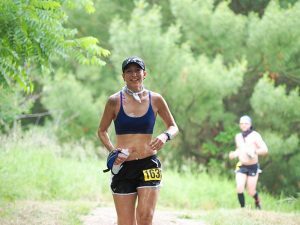 I didn’t pay much attention to the course the first time through, I got wrapped up in chatting with another runner so the second time was all new. I found myself saying “hmmm, I don’t remember that on the last lap… weird.” After the 2nd loop I was already struggling with the heat and after the 3rd loop my stops were becoming longer and longer. I dragged my feet quite a bit at my stops and I had to basically talk myself into going out for another loop. This loop course became a challenge mentally because I could just stop whenever I wanted. 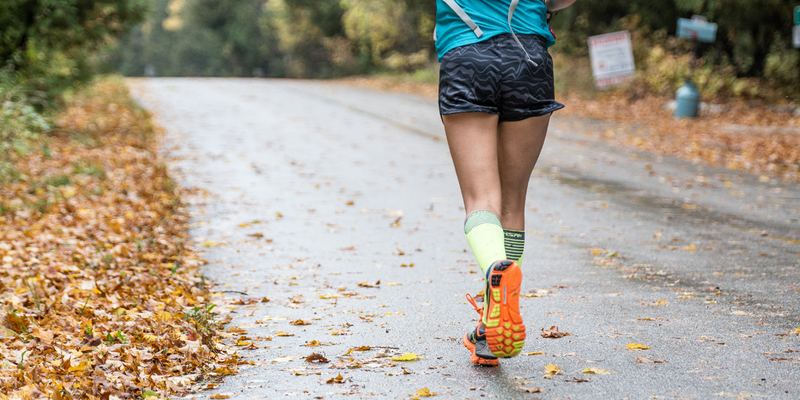 I didn’t have to push my body or suffer much because I WAS in control. I knew this was dangerous thinking, but I let myself stop as much as I needed, I decided to cool down and head out for just one more. Eventually I figured out that my lows happened when I started to over heat. Once I’d cool down a bit, I’d feel better, be able to run a bit more and feel more optimistic. I carried ice in my pockets, baggies of ice in my bra and in a bandana around my neck, and had ice water in my bottles, but once that ice melted, so did my positive attitude. The ice would melt and I’d be out of water before the mile 2 aid station and I’d stop and refill again. It was actually ridiculous how much water I was drinking and soaking in. Along with taking in a lot of water, I had to start taking in more salt. My fingers started to swell which meant that I needed more salt to balance out the water that my body was begging for. 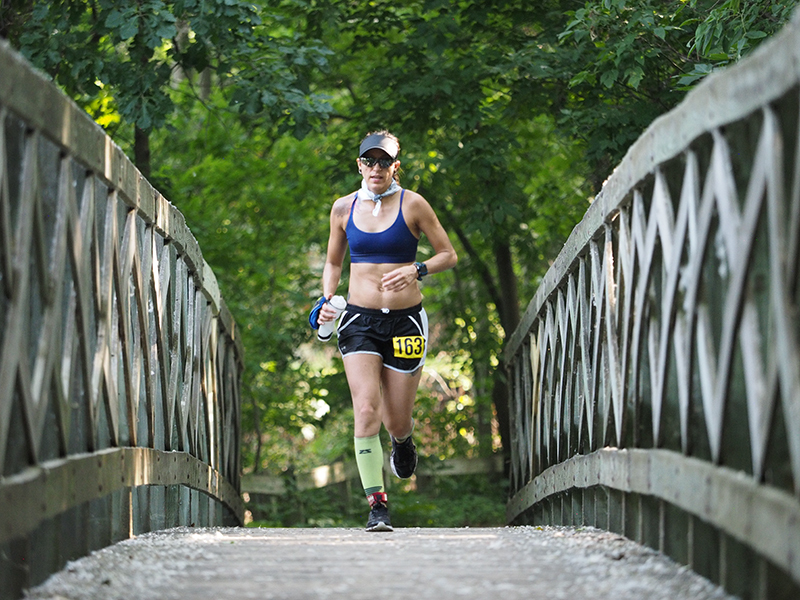 So I started chowing down on salty snacks like chips and pickles along with taking Endurolytes throughout the race. I also decided to pour more cold water on my body instead of taking it in to help balance the electrolyte and fluids in my system. The constant water outside of my body meant that my hands were pruned all day and my feet would suffer the most. I blister on a few toes regularly, but they never hurt. Having water poured on me all day meant that my feet were wet for 8 hours. After 4 hours, I dunked in water and changed my socks and shoes. My blisters were HUGE and full of fluids. I did my best to cover them in body glide and changed into dry shoes. Later in the next loop, one of those blisters popped as I made my way down my favorite winding downhill. The pain was HOT and stabbing and had me cursing, yelling and limping. I was certain the day was done. After about 5 minutes of walking the pain subsided and I picked up running again; bodies are so weird. The first half of every loop was a struggle for me. It was mostly dirt trail, a bit like a single track but a tame single track and there were a bit more hills than I was expecting. The second half of the loop leveled out a bit and there was a good amount of crushed gravel that I could get some good running on. As I completed more loops I was able to remember what was next and when I’d be where. It went like this, Aid station, small climb, fun winding single track downhill (one of my favorite parts), small pond, gravel path, run faster, golf course, road, BADASS bridge and back to ultra camp. I guess I really enjoyed that part of the loop. By loop 5 I was taking more than an hour to get around the loop, mostly because I was spending so much time dragging my feet at the start/finish line. I ate pickles, olives, chips, dunked in the huge cool water tank, dumped water on myself, and did all that I could to keep a positive mindset and that worked for me. I got through an incredibly hot day, in fact the hottest I’ve ever run in, and I didn’t hate every minute of it. Most of my time on the trails was oddly solo, except for the first loop. Once everyone headed out we all seemed to separate which was a good thing, and a bad thing. I felt a little lonely during my lows but every once in a while a new face would cheer me right up. The best thing about this whole race were the volunteers and aid stations. Everything was top notch! I’d roll into the half way aid station steaming hot and the volunteers would know what I wanted BEFORE I wanted it. While I was dragging my feet at every stop, they were there hustling to get me back on the course. They were SOOOO GREAT! Toward the end of the race, which was 1pm for me, I had a little over an hour to finish my last lap, I was little nervous because as the day dragged on, the heat was really slowing me down. There were portions of the course that were no longer shaded because the sun was high in the sky. Even though there were only a few spots, they definitely wore on me. I ran into the start/finish at 7 hours and 46 minutes and called it a day. It was a good day, a hard one, but definitely a good one.